Dual Port RS-232 Serial PCMCIA Card. Provides a reliable solution for Notebook to connect serial peripherals such as GPS receivers, serial printers/plotters, barcode scanners, digital cameras and fax/modems. 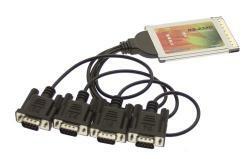 This quality PCMCIA serial card adds four serial ports (RS232) to Notebook Computers. Automated flow control, Hardware or X on / X off..Serial Port PCMCIA Feature - Automated in-band flow control using Programmable Xon/Xoff characters. Supports 4 RS232C Serial Ports with a DB9M Cables. Provides 4 DB9-Male RS232C serial port connectors with a 15-pin to four DB9M cable. Please note: This is a PCMCIA Cardbus card, not an ExpressCard. Some notebook computers take ExpressCards. If you aren't sure which one you need, please verify if your system has a PCMCIA Cardbus slot or an ExpressCard slot before placing your order. If you do need an ExpressCard instead, please go to Serial & Parallel ExpressCards to order one.